In the previous pAsuram, AzhwAr mentioned that it is only emperumAn who is apt to be attained by everyone including brahmA, rudhra et al. When the question arose as to why AzhwAr is saying that emperumAn is the only supreme entity to be attained when some people say that brahmA and rudhra are also fit to be attained, AzhwAr negates the philosophy of those who speak against the supreme nature of emperumAn by saying that the concept of equality among the thrimUrthis (brahmA, vishNu and rudhra) is ill-fitting and that it is only emperumAn who is the supreme being, thus establishing his philosophy in this pAsuram. mudhalAm enbar – are the causative factors for the origin of earth, (some people) will say. mudhalvA – Oh one who is the causative factor for the universe! kAr nigar ilagu uruvA – Oh one who has a divine form matching the dark clouds! nin agaththadhu anRE – is it not forming from your divine form? mudhalAm thiruvuruvam mUnRenbar – Some people will say that brahmA, vishNu and rudhra are all responsible for the creation of this world. These people, who say that all the three mUrththys are equal, are called as thrimUrthi sAmyavAdhis. onRE mudhalAgum mUnRukkum enbar – Some others will say that the reason for the creation of these three mUrthis is another entity, superior to these three. Those who say that there is a fourth entity which is superior to the thrimUrththys are called as thrimUrthi uththIrNavAdhis. Since AzhwAr refers to these people as “enbar” (will say like this), he affirms that his philosophy is different from that of these two types of people. Taking these two examples here is representative of similar arguments which talk about the oneness of thrimUrthis. AzhwAr further explains that these arguments are not proper. . . .
mudhalvA – Oh one who is the causative factor for all the worlds, including brahmA, rudhra et al! nigar ilagu kAr uruvA – the words should be rearranged as kAr nigar ilagu uruvA to get the correct meaning – one who has a divine form which matches rain bearing cloud. AzhwAr hints that since emperumAn has bluish form which removes the ennui of those who see him and has the complexion of cloud which gives rain without expecting anything in return, only emperumAn is the supreme entity. Hasn’t thirumangai AzhwAr also established the supreme nature of emperumAn in his thirunedunthANdagam pAsuram 2 “Oruruvam ponnurugam onRu sendhI onRu mAkadal uruvam oththuninRa mUvuruvum kaNdapOdhu onRu AnjOdhi mugiluruvam emmadigaluruvandhAnE ” (one form has a golden hue (brahmA), one has reddish fire like hue (rudhra) and one has the hue of huge ocean; when the three forms are analysed together, the form of one with radiant, rain bearing cloud is that of my emperumAn)!. AzhwAr clearly establishes next that it is emperumAn who is causative factor for the other two. . . .
ninagaththadhanRE pugar ilagu thAmaraiyin pU – Isn’t the lotus flower, which has the distinction of being the place of birth for brahmA, located in your divine navel? 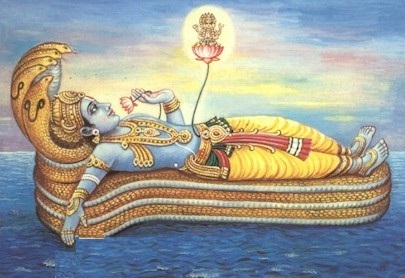 This clearly establishes that brahmA who was created on the lotus emanating from his divine navel and rudhra who was created by that brahmA, cannot be emperumAn’s equal ; it is only emperumAn, being the leader of the other two, who is the reason for creation of the worlds; since there is no mention about a fourth entity, different from these three, who has created brahmA on a lotus, it is not possible for a fourth entity, different from these three, who can be the cause for the creation of all the worlds. This also proves that brahmA, who was created on a lotus and rudhra, who was created by brahmA, cannot be equal to emperumAn who created brahmA in his divine navel, thus negating the thrimUrthyaikya vAdham (oneness of thrimUrthis). Has it not been shown in Sri vishNu purANam 1-2-66 that it is janArdhana (emperumAn) who remains as the indwelling soul of brahmA and rudhra and carries out the functions of creation and annihilation? “srushtisthithyanthakaraNIm brahmA vishNu SivAthmikAm I sa samgyAnAm yAthi bhagavAnEna Eva janArdhana: II” (it is janArdhana, that bhagavAn, who attains the names of brahmA, vishNu and Siva who carry out the functions of creation, sustenance and annihilation respectively). One could show the atharvaSika SlOkam 1-2-15 “brahmA vishNu rudhrEndhrAs thE sarvE samprasUyanthE” (brahmA, vishNu, rudhra, indhra are all born) and say that the thrimUrthis are born [in other words they are created]. But since this only reflects the famous vEdha vAkhyams (lines from sacred texts) it is clear that the births of brahmA and Siva are due to their karmas (past deeds) and birth of vishNu is due to his necessity to incarnate. parASara bhattar (son of kUraththAzhwAn) also showed the same meaning in SrI rangarAja sthavam 2-51 “vidhyE virinchagiriSam prathamAvathAra: thath sAmyatha: sthagayithum thava chEth svarUpam I kim thE parathva piSunairiha rangadhAman sathva pravarthana krupAparipAlanAdhyai: II” (Oh SrI ranganAtha! If the purpose of your first incarnation is to hide your basic nature, between brahmA and rudhra, then what is the benefit for you by exhibiting your superior qualities of being the controller of sathva guNam (purely good qualities) and protecting (brahmA, rudhra et al) through your mercy?) It is pertinent to recall here the 116th SlOkam of SrI rangarAjasthavam pUrvaSathakam by parAsara bhattar “thrayO dhEvasthulyA: thrithayamidhamadhvaitham adhikam thrikAdhasmAth thathvam paramithi vitharkAn vikatayan I vibOrnAbhIpadhmO vidhiSiva nidhAnam bhagavatha: thadhanyath brUbhangIparavadhithi sidhdhAnthayathi n:II” (emperumAn’s divine navel which negates hypotheses such as (1) All the three mUrthis are equal; (2) All the three mUrthis are one; (3) there is another entity which is superior to the three mUrthis and which is the root for brahmA and Siva, establishes for us clearly that the entire world is under the control of emperumAn’s knitting of the eyebrows). Let us move on to the 73rd pAsuram next. This entry was posted in iyaRpA, periya thiruvandhAdhi on January 23, 2019 by T N Krishnan.